Laura read Law at the University of Stirling obtaining a 2:1 LLB (Hons) Degree. She also holds a Diploma in Professional Legal Practice from the University of Strathclyde. While at University, Laura had a number of outside interests including volunteering at Citizens Advice Bureau, working part-time in a social enterprise and a four month work placement at Anderson Strathern. Her strong interest in human rights led to her securing a self-sought volunteering position at Govanhill Law Centre. Laura continued this beyond her Diploma and complemented her skills and experiences by obtaining employment in boutique private practice firms. Particular areas of interest that Laura developed included litigation, housing law, and private client work. With an interest in litigation, in July 2017, Laura moved to Shoosmiths LLP where she worked as a Trainee Case Handler. This role principally involved raising and progressing Simple Procedure actions and Laura gained a working knowledge of the rules and their application in practice. 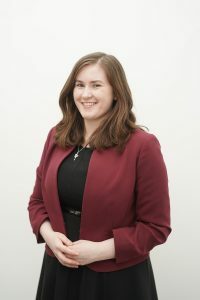 Laura commenced her position as a Trainee Solicitor with Govan Law Centre in December 2017. The implementation of the Simple Procedure Rules completely changed the legal landscape for civil court actions in Scotland. The new rules cover cases of a value of up to £5,000 and have replaced both Small Claims and Summary Cause actions. Cases of a value of less than £3,000 which fall within the Simple Procedure are not covered by Civil Legal Aid. In these cases, those who rely on Legal Aid are unable to instruct a solicitor to appear on their behalf in Court. Representing yourself, particularly as a Respondent, can be daunting and consequently many Respondents do not appear at Court. In their absence it is more likely that a Decision will be granted against them. My project will look at ways this gap in Legal Aid funding can be addressed with the intention of increasing access to justice.